For the second day in a row, the Humpherys found paper currency! My daughter found two dollars folded up neatly on her way home from school. I found three pennies myself and felt pretty darn accomplished because our searching ability isn't as extensive as before. This weekend hubby and I will be running an out of state ten mile race- hopefully we'll be able to find some change out there :) Have a great weekend! Today we found our first dollar bill find for FY 11 - the crumpled up dollar bill waited for us right on a patch of grass (or what looked like grass at one point!) right on our block. Hubby made the find despite all four of us looking around in our normal fashion- YAY! today we found two pennies during our after dinner walk. Seems like it's getting darker alot earlier nowadays- not good!! Today we found no coins- but we did get to hang out with my co-workers for employee appreciation day at work. Had a blast!! Today we hung out around Brooklyn all day and found some decent coinage- 68 cents in the form of two quarters, a dime and eight pennies the hard way! Today we cashed in on the brooklynite discarding of pennies near parking meters- found six pennies and one quarter that way. The rest of the change was found in the park where Kitty played for a little bit while dad and I chatted about the future. During our outing, we stopped off at our nearby neighborhood bank to inquire about the current savings rate. I can't believe how low our rates are nowadays! 0.10% seems inconceivable!!! When will this nightmare end??? Today we found a total of twelve cents in the form of a dime and two pennies- all found by hubby on his travails to and from work. 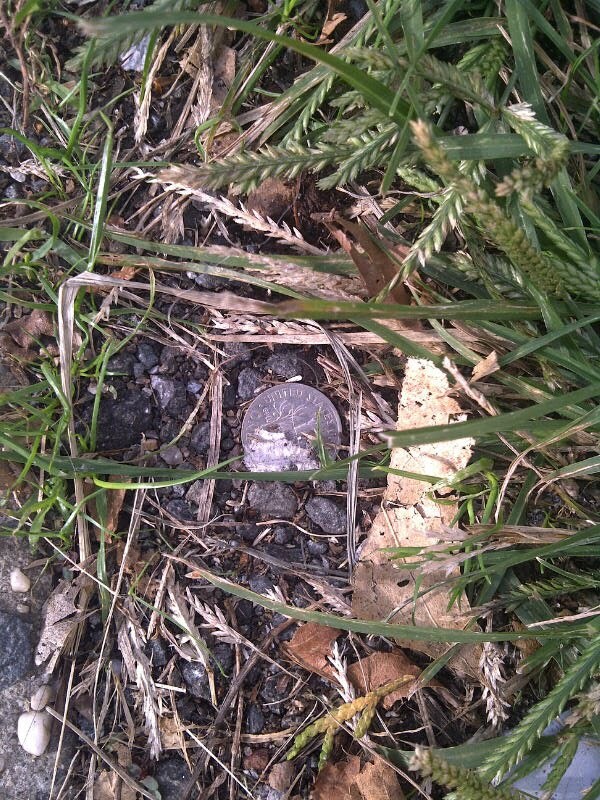 Here's a pic of today's found dime in it's found location from hubby's super cool phone. Today's dinner walk was postponed due to the high winds out here (remnants from the nor'easter). Hopefully the wind won't be too disruptive tomorrow in order for the Humpherys to hit the town :). Enjoy your evening! Today we found a total of $0.39 in the form of three dimes, a nickel, and four pennies. The very first find was a nickel hidden nicely amongst some freshly cut grass in my neighborhood. I was excited because it has been a while since I got back into blogging my finds and I'd forgotten how much fun it was to see the amount of change found on the ground grow from one tiny jar to another until it reaching its final home - our giant five gallon water bottle. The family and I are going for a nice walk after dinner tomorrow night. Score! Yet another reason why I love blogging our finds: more opportunity to spend time away from the TV and Internet. Love it!! One advantage to waking up at 5am to go to the gym is the ability to examine parking spaces :). I found a scratched up dime and nickel after my hour gym sesh. My hubby found an old wallet that had nothing inside it (guess the bandits made out with what was once in it? ), my daughters found zip, and thus another day passes on with fruitful bounty towards the change pot '2011. Today we found a collective total of $0.76- all hail last nights' rainstorm!! Hubby found $0.25 in the form of a dime, two nickels, five pennies and one seeriously eroded quarter. I found a quarter on my way to work and my daughter found $0.26 in the form of a quarter and a penny on the way to school. Earlier this year, I remember finding $0.26 on two interesting occasions- both of them on days that I participated in half marathons (13.1 miles). I keep thinking 26 cents is a sign from the running gods that I should go for the gold and be part of America's 1%- more on that as I continue my trainings though. As it once began ever so humble, the changepot is back again- a few days after it's birthday but better late than never I say :). Today seems like a peculiar calendar date indeed - 10/10/10. The fam and I went apple picking today at Alstede Farms in Chester, NJ. The place was packed but we managed to squirrel away a few apples and find some change on the ground. Kitty found a quarter in the rocky parking lot, mom found a scratched up nickel, and we found three pennies on the way back home. Life is sweet but finding change nowadays is even sweeter! Despite us not logging our change finds in well over a year- we have found a lot of change but it wasn't documented. Instead of counting the coins from last year- we've decided to cash in the change and donate it outright to a charity run coming up next month. Details on that will soon follow! :) But for right now, we begin our tale again with a humble report- $0.33 on this warm, Indian Summer day!